I was honoured that Mencap posed this question to me, and here is my answer, in the form of a poem (bear with me, poetry is not one of my superpowers). When I was asked to write about my superhero I wondered where on earth to start. Would I write about our daughters who have taught us so much? Mia the thoughtful, gentle soul, with a keen sense of right and wrong. A feisty know-it-all, equestrian and dance queen? Natty who melts hearts wherever she goes, and demands a rethink from all she meets about what Down's Syndrome means today. A model fighting for ad inclusion, a loving daughter, an annoying sibling, a team player, a valuable classmate? Or my unfaltering husband who simply announced that Natty was our daughter and that she would be fine as he proudly held her aloft on the day that she was born? Our wider family who swooped in to help? The wise midwife who shook me out of my self-pity, the breast feeding support, the trainee doctor who smiled and told us we would be ambassadors for children like Natty when she was 3 days old. I wish I could track him down and tell him how motivating his words were. But I couldn't miss out the surgeons and doctors that had saved Natty's life. Or the neonatal nurses that cared for her, and nurtured our bond in the early days. The emergency middle of the night medical strangers, the familiar staff on the paediatric wards. Where would we be now without people like that? And what about the physio and SALT and portage worker who lifted me with tea and encouragement each week in the early difficult days as they gently encouraged Natty to reach her potential. The teachers and TAs at Pre-school and school who embraced different methods of teaching, who believed in Natty's abilities and spent hours working out what they were and how to nurture them. To everyone who has seen my worry, tears, frustrations and listened. To those who offered childcare, tea, hugs, meals, advice, resources, some of whom I have never met in the invaluable online support network. The charities we couldn't have done without, both those who have provided support directly relevent to our family, and those who work for a safer better future for our children. The fellow ambassadors, the writer, the photographers, the campaigners, the politicians who believe? And finally the wonderful adults I have met along this journey who have a learning disability. They light the way for us, make our lives more colourful, show us what is possible. They are the role models for our children. So, a mix of them all is had to be, and my poem depicts a superhero made up of all these people. A multi-facetted superhuman, whose costume and appearance might change but who influence remains constant. Thank you to our super heroes this Learning Disability Week. Join in the hashtag #LDWeek13 on Twitter and link up your posts their or in the linky below. 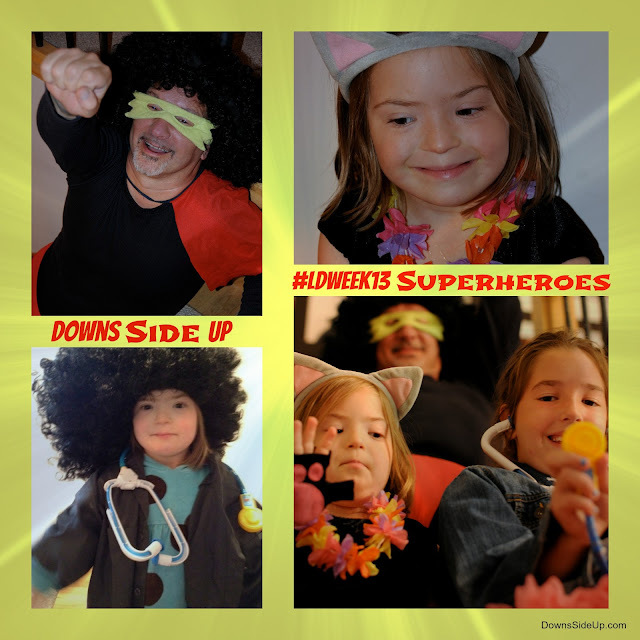 You can follow our exploits @DownsSideUp as well. What a truly inspiring piece. Great poem. And I love your positivity - and that there were so many superheros to be positive about. Thank you. Things aren't always right but we have a great deal to be thankful for don't we.